One question often asked by guitarists is how to choose the perfect gig bag for their instruments. As all musicians know, it is very important to find the best way to store and protect their babies. Many guitarists have been eschewing their heavier, bulkier hard guitar case in favor of gig bags, which are becoming a popular alternative to cumbersome hard shell cases. Naturally, it is important to select the best gig bag if you want your guitar to stay pristine. A gig bag, simply put, is a soft-sided bag used to store and transport one’s instruments. Unlike bulkier hard guitar cases, a softer and smaller gig bag can help decrease clutter and save space. This is a blessing when you consider how much of your closet you probably already devote to your musical instruments. Like a traditional hard guitar case, a nicely padded gig bag will help prevent nasty scratches and dents. But there are some very clear advantages outside of saving space for your other possessions. A gig bag (like the ones made by Gator Cases) can provide additional storage for the musician on the go. If you select the right gig bag you will have space not only for your guitar but for your other stuff as well: picks, music sheets, tools, additional strings, you name it! If you’re a guitarist who lugs his own gear to shows, a soft, lighter-weight gig bag could be the perfect solution for getting your instrument from location to location safely. Perhaps the most popular reason to choose a gig bag over a hard guitar case is that they typically come with straps. This allows them to be worn on the shoulder or back. This, of course, makes it easier to carry your guitar wherever you want and look good doing it! Some hard cases come with rings for attaching straps; however, that doesn’t solve the problem of the additional bulk. “I will opt for hardshell cases when longer travel’s involved, though—either road or plane,” he adds. 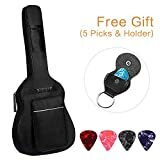 A hard guitar case will always provide superior protection when compared to softer options, so you should absolutely use them when you are concerned that your equipment will be thrown around. Or when you suspect that they will suffer more than a “normal” amount of wear and tear. But you can minimize risk by choosing a high-quality gig bag. This means that you should probably skip over cheaper options, as cheaper thinner bags are only really good at keeping dust off your instrument and perhaps looking stylish. Protecting the sides of your guitar is not enough, so padding is an important thing to pay attention to. You want to make sure that your gig bag will properly provide armor for the back and the top. It is also very important to make sure that there is enough protection in the neck area to keep that part of the bag stiff or you’re going to end up wanting to break the neck of the person who was responsible for the poorly-designed bag that allowed your guitar’s neck to be broken. A waterproof covering is also a must, especially if you plan to go outside or if you are ever going to be in an area where a careless person might spill a drink on it. Your gig bag should have at least one zippered compartment (preferably with flaps to keep rain or other liquids from seeping in) that is big enough to house a cable, some 8 1/2 x 11 sheets of paper, and any other accessories you might want to bring along with you. You’ll also want something with rubber tread to prevent wear and tear because your gig bag, like your guitar, is an investment. Obviously, you want something that looks nice and fits your personality — and you definitely want to pick one that is right for your instrument. You wouldn’t want to put an electric guitar in a gig bag designed for an acoustic any more than you would put a square peg in a round hole. There are a lot of options out there for you to choose from, whether it’s a Gator Case or Fender or any of the plethora of gig bags on the market. And since you want to protect your investment, you definitely want to have the right gig bag whether you play acoustic or electric guitar. Here are some of the best gig bags for both. Looking for a great acoustic gig bag? Here are some of the best options for you! The Fender Dreadnought is another excellent choice, featuring mesh padded backpack straps, a zippered front pocket with numerous organization options, and soft velour lining. Plus, it looks absolutely beautiful and is incredibly sturdy. Looking for a budget option? Faswin’s acoustic gig bag features six pockets so you definitely have the ability to stay organized on the go! It features thick padding and comes with a guitar strap and a ten pick sampler. This is definitely a solid choice if you’re strapped for cash and can’t afford some of the pricier options! Shopping for something in which to keep your electric guitar? Here are some solid choices! The Gator Cases Pro-Go Ultimate really is the ultimate in gig bags! It features super-thick padding, a protective rain cover, adjustable backpack straps, and an internal shock absorber. It also has multiple pouches to keep your accessories in. It’s worth every penny. 0.5-inch thick sponge padding, thicker-padded than previous version, will protect your guitar from bumps and scratches. The St. Louis Music’s electric guitar bag features large pouches for carrying whatever you want and 25mm of padding. It’ll make sure that your guitar is protected just in case you drop it or something else happens. It also looks spectacular and is sure to be the object of all of your friends’ envy! Need a budget alternative? 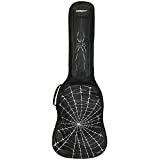 Look no farther than ChromaCast’s spider graphic gig bag, which features a rubber bottom bumper for added protection. It also has three pockets, so it will carry pretty much whatever you need. Plus, it has a spider design which is pretty badass. A hard case is definitely better for lengthy travel, flight, and whenever you will be putting your axe through extra strain. Of course, a gig bag is an amazing alternative for most situations. This is especially true if you don’t feel like lugging around the extra bulk and weight. No matter what, it’s important to evaluate your options and pick the right gig bag or guitar case for you!